A preliminary design for a battleship to be funded in Fiscal Year 1917, sent on 28 March 1916 to the Navy Department. This design generally followed the Tennessee, differing in replacing triple 14-inch gun turrets with twin 16-inch turrets while adding a fifth twin 16-inch gun turret aft. This design was the least risky means of providing ten 16-inch guns on a ship adapted from the Tennessee and was recommended by the Navys General Board to the Secretary of the Navy. Navy Secretary Josephus Daniels disagreed, directing instead the simplest 16-inch gun adaptation of the Tennessee design, Preliminary Design No.163 (see Photo #: S-584-095). 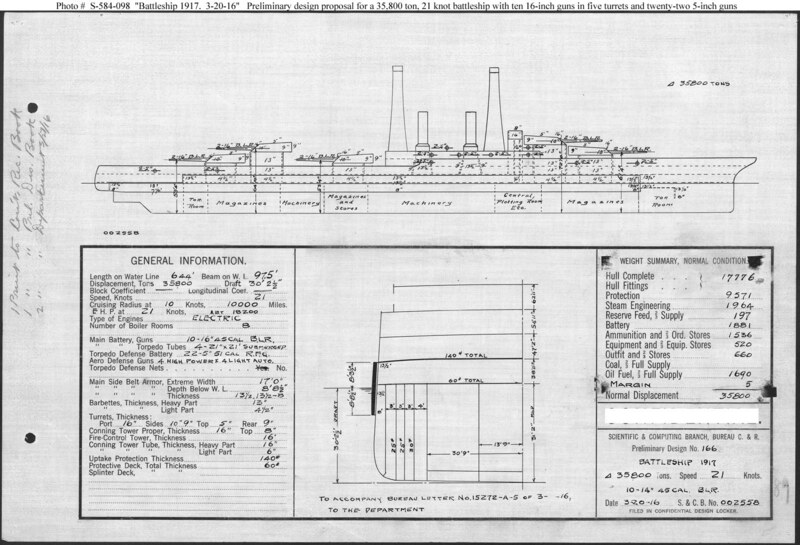 This plan provided ten 16-inch guns, electric machinery, and a speed of 21 knots in a ship 644 feet long on the waterline, 97 feet 6 inches in beam, and with a normal displacement of 35,800 tons.